Cat Watch 2014: The New Horizon Experiment is a three-part follow up to 2013's The Secret Life Of The Cat. This time the Horizon team tracked and monitored 100 cats from varying urban environments in a further scientific exploration of the behaviour of Britain's felines. Using the latest in GPS and movement technology, Professor Alan Wilson, and his team from the Royal Veterinary College, set out to discover how cats from the town, village and farm differ in their characteristics. And these feline subjects in particular proved that when it comes to personality, no two moggies are the same. We found out more about our favourite Cat Watch 2014 stars Ted, a chilled-out cat who's a sucker for having his belly stroked, and Ozzy, a cool cat who was the reigning king of Brighton's streets. 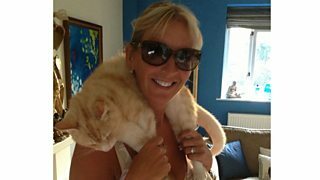 Ted, the laid-back village cat, has mastered the art of being a pampered pet: turning over to have his tummy tickled and even joining in with owner Helen Chilvers’ yoga sessions. Helen says: "He is much more interactive than any cat we've owned. He is more like a dog really. He is never in a bad mood. He smiles at us and just uses his charm to get around things. "He’s so friendly and chilled: you can drape him around your neck, hang him upside down or hold him like a baby and he just carries on purring and being completely relaxed in your arms." "He can be quite playful and cheeky too. He is very inquisitive and likes to join in on any activities - not just yoga. He ‘helps’ in the office, catching the cursor on the screen at times. He just has to be involved." Unusually for a cat that’s so taken with domestic life, Ted was actually born on a farm alongside semi-feral cats. Helen says: "We noticed he was relaxed from the start as a kitten. He was really affectionate when we visited the farm he was born on, and this is why we ended up taking him and another cat, Dora, home (even though we weren't planning to get any more cats). "We have noticed over the years that most of the family of farm cats are friendly, so I think some of it is in his genes. He's also been handled a lot and has bonded with us as his humans, so likes spending time with us." Town cat Ozzy, on the other hand, gave his owners just an hour-long window of opportunity for any affection. 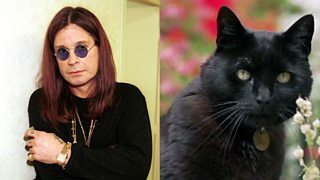 His owner, Rae Stones, says: "He was named after Ozzy Osbourne. He was always crazy, even when he was tiny. He was wild, and completely fearless too. 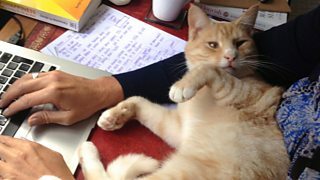 "We had a window of between 5am and 6am where he'd sit close, let us stroke him and meow. That was about it [for affection]. "I've asked myself many times [why he is the way he is]. I don’t think we had any influence on his personality. He came like that." Sadly, Ozzy has passed away since production on Cat Watch 2014 ended. And unlike Ted, who’s content to play in his owners’ garden and relax at home, Ozzy made a name for himself in the neighbourhood by patrolling the streets, and getting to know other residents. City cat Ozzy, wearing a camera on his collar, has a stand-off with rival cat Smudge. Rae says: "We, and many other people in the street, were at his beck and call. He was King of the Street. He knew that and everyone who lived in the street knew that too. "He used everyone's house as a thoroughfare. Quite a few people would leave their front doors ajar all day, so he could come and go as he pleased. He was overweight as he was being fed at a variety of places. "He would sit on the pillar by the front gate and greet everyone that walked down the street [with a meow]. Apart from the postman. He'd growl at the postman. He'd do this is even in the pouring rain. "If he saw me in the street, he'd run and leap up in the air. Then chase me." Cat Watch: The New Horizon Experiment is on Tuesday, 8 October at 8pm on BBC Two and BBC Two HD. It continues on Wednesday, 9 October at 9pm and Thursday, 10 October at 8pm (11.25pm Wales). For further programme times please see the episode guide. BBC News Magazine: Cat Watch 2014: What's it like being a cat?